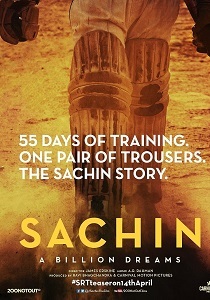 Barring a small portion which revolves around Sachin's childhood which has been acted out/dramatised, the film consists of real-life footage and commentaries by Sachin, his friends, collegeagues, relatives and other people who have known the sport star or had made some sort of an acquaintance with him. You always know what you are in for in a biographical drama. You have seen or read about those amazing sports icons achieving against odds and with meagre means. Sachin: A Billion Dreams' is like a lifetime innings which should not be missed by everyone who knows and love Sachin Tendulkar. He Came, He Conquered & Taught Us To Chase Our Dreams! Tendulkar himself narrates throughout (there are also some shrewd contributions from cricket journalists Gideon Haigh and Harsha Bhogle), and comes across as likeable and very modest. Find Yourself Cheering ‘Sachin Sachin’ In Theaters Now! Sachin Tendulkar biopic is a must watch for every Indian! ‘Sachin: A Billion Dreams’ is an experience that not just Sachin or cricket fans, but every Indian should feel. There is an old blanket in my cupboard about to give way any minute.